Offered is a nice early American coin silver teaspoon by noted Philadelphia silversmith Joseph Shoemaker, circa 1805-15. This piece has a good period engraved script monogram and a clear maker's mark. 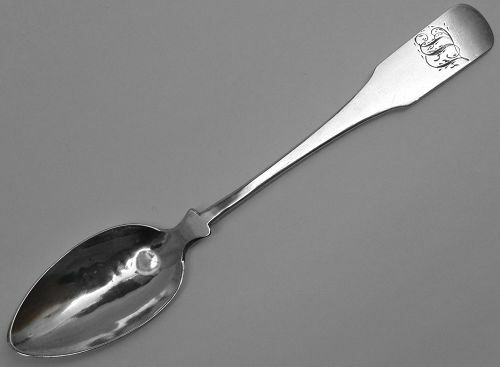 This teaspoon measures about 6 1/4 inches in length and weighs about 17 grams. Condition is fair at best, with some dents to the bowl and a slight twist to the handle, but with no splits or repairs. All in all a good example of a short-lived style in Philadelphia coin silver!